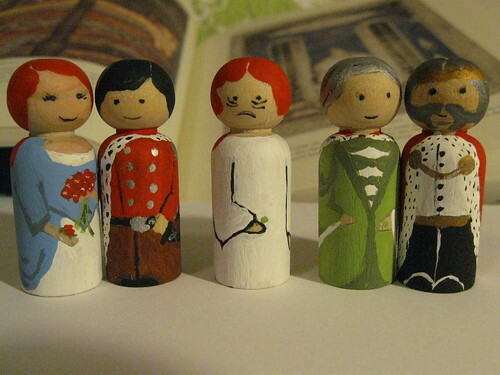 Here’s another craft from my past that I wanted to share with you–I made these dolls in 2010 for a Princess and the Pea themed swap package. The Princess and the Pea is a strange fairy tale, but I’ve always found it compelling and I think it’s because I love the idea of all those mattresses. How fun would it be to sleep on a pile of hundreds of mattresses? Okay, probably not that fun, considering the fact that bunk beds make me nervous (you roll off of a bunk bed once, you never forget it). It’s still a fun image, though, and these dolls were a lot of fun to make. 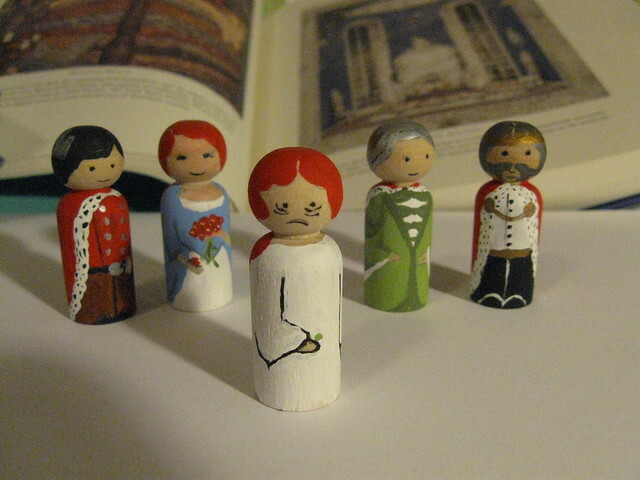 I made five dolls–the king, queen, prince, and two versions of the titular princess, one in her nightdress (exhausted from a night of tossing and turning) and one in a blue gown with flowers, ready to marry the prince. See how adorable and little they are? 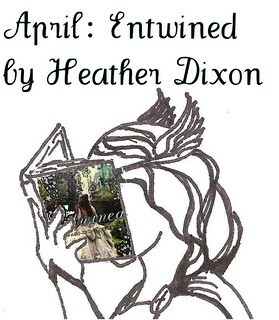 I’ve mentioned before that I participate in a Folklore & Fairy Tales group on Ravelry, and that we do seasonal package swaps, which I always love! My last package had an owl theme, inspired by my swappee’s screenname. 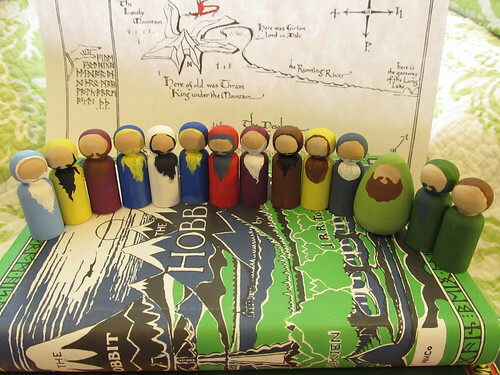 This time, however, our seasonal discussion and knit-a-long topic was The Hobbit. 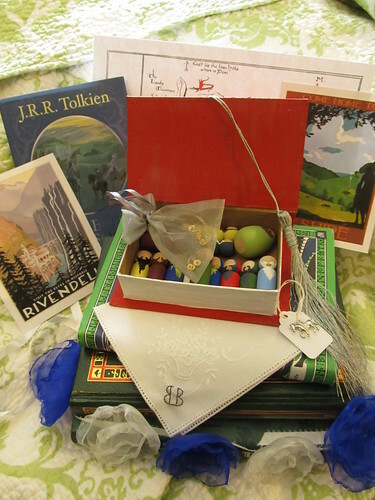 As you may have noticed, Tolkien is one of my favorite things, so I enjoyed putting this package together. Here is the package! ...except that those three copies of The Hobbit? Those are all mine. They're just in the picture to hold other things up in an aesthetically pleasing fashion. Yes, it is necessary for me to have three different copies of The Hobbit, why do you ask? My first idea for the theme of the package was for it to be a collection of the things that got left behind during Bilbo’s journey–the buttons he lost while escaping from goblins, a handkerchief he probably dropped, etc. Then things just sort of…rolled along, and before I knew it I was writing a letter under the name of Thistle Took (yes I gave myself a hobbit name, because I am cool), a hobbit historian researching the history of Bilbo’s journey in order to write a book about him, and sending some of the artifacts she’d collected to be housed in a museum of local history in the Shire. 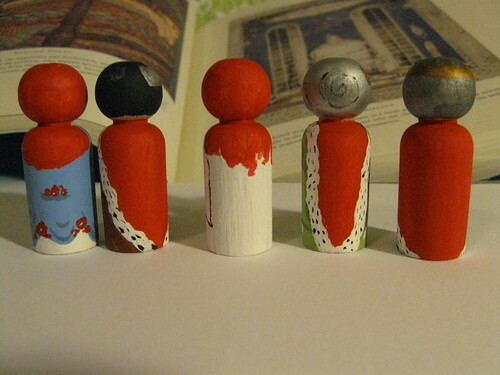 The dolls are my favorite thing. I am so happy with the way that they turned out! 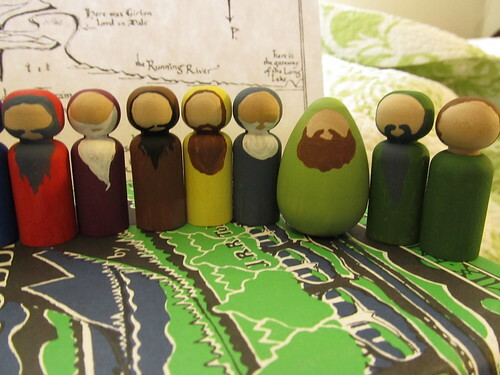 They’re very simple, but I think they’re very cute, and fat Bombur is so adorable that I might just die. 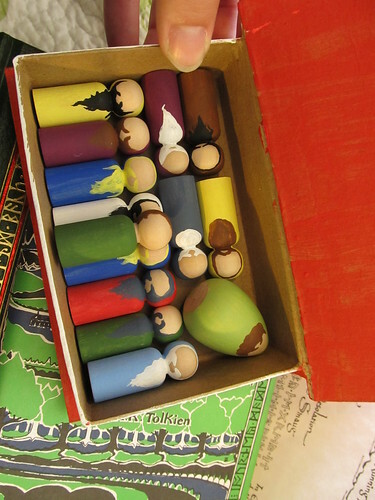 Bilbo, of course, had to borrow a dark green cloak, and has no beard. 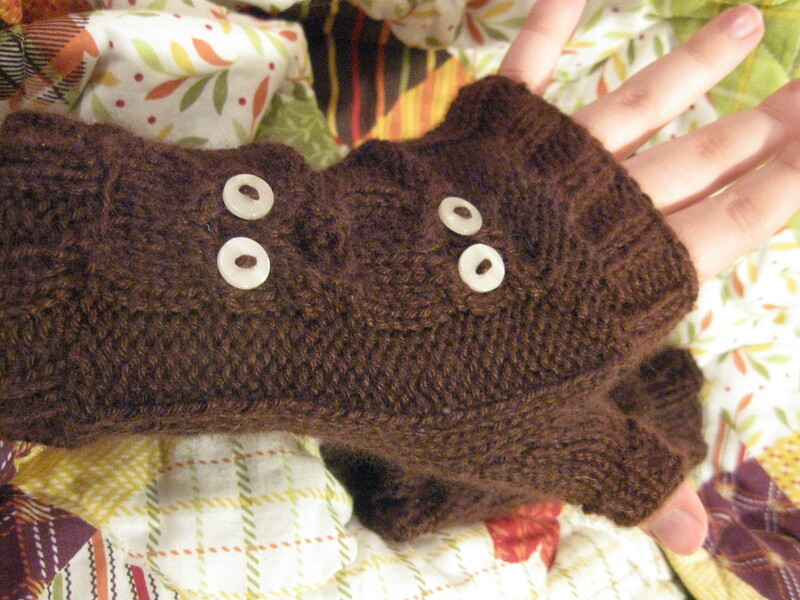 First I made fingerless mitts, because everyone always needs fingerless mitts! 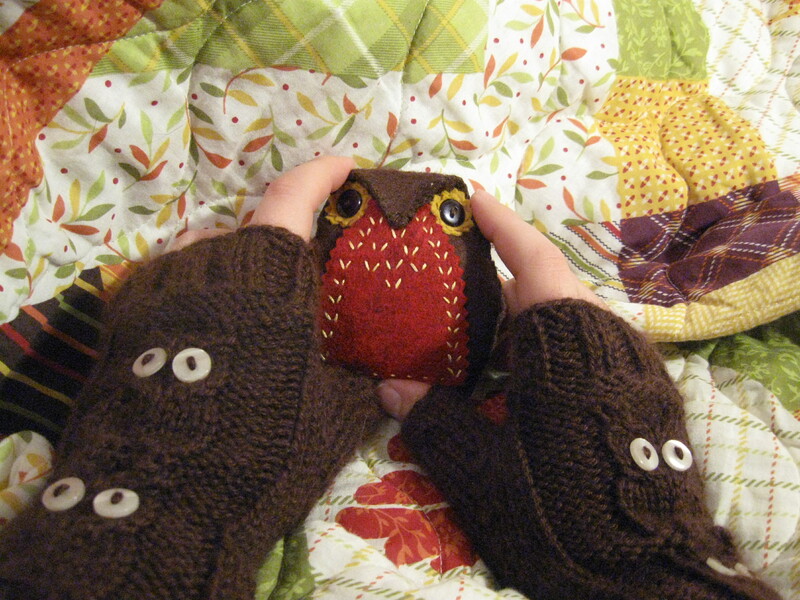 I managed to improvise this pair, without following a pattern (so of course they aren’t perfectly symmetrical), with cabled owls that have been featured in several different patterns that I’ve seen–I don’t know where it originated, but you can see other patterns using it here and here, and in my favorite here (scroll down to find the pattern ‘owls’). Do you see the owls? 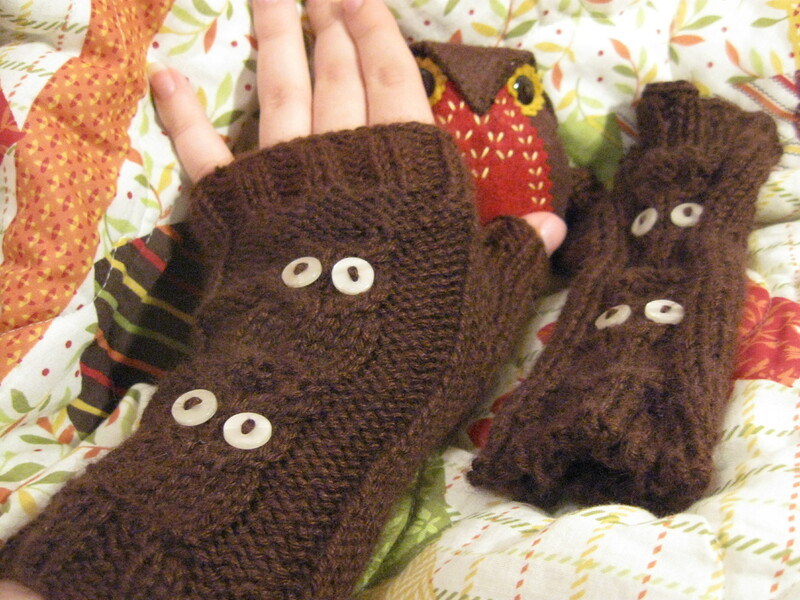 They’re knit from a soft and cuddly angora/bamboo blend, with shirt buttons for eyes. He stitched up by hand really quickly–perhaps an hour or so. 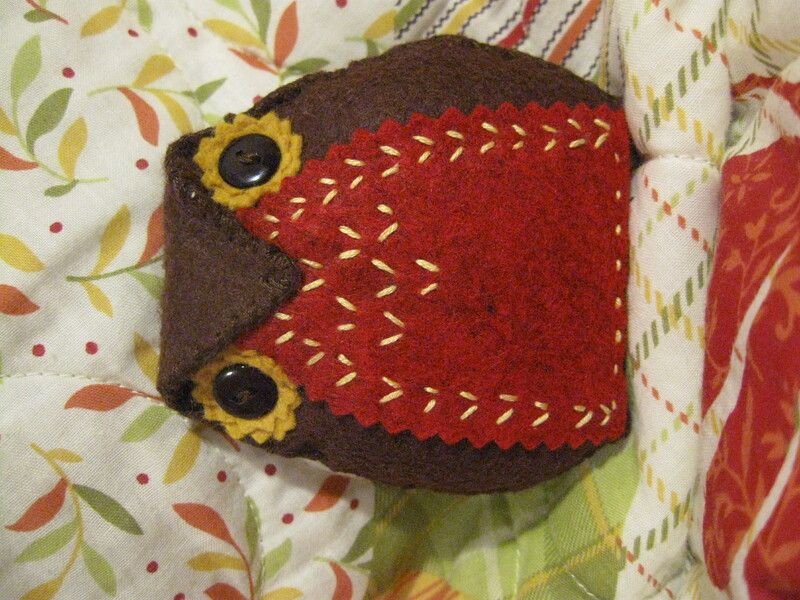 I think that this style of soft owl originated in a Japanese craft book, but I was inspired by this tutorial. If you follow that link you’ll find a template to download, but the owl is such a simple shape that I cut mine out freehand (…so of course he isn’t symmetrical either!). It’s just a teardrop shape with the point folded down, and voila! I used pinking sheers to cut out the red piece and the yellow circles that I added around his button eyes, and for a little detail I embroidered his chest. I’m so pleased with how he turned out–I think he’s darling! And he would, by the way, make an excellent pincushion.